If you go to Google Maps and zoom into the World Trade Center Site, you will see that Google has labeled the area, "Ground Zero." Ground Zero was what many people started calling the World Trade Center after the terrible attack on September 11, 2001. I think most of us still remember the day vividly. 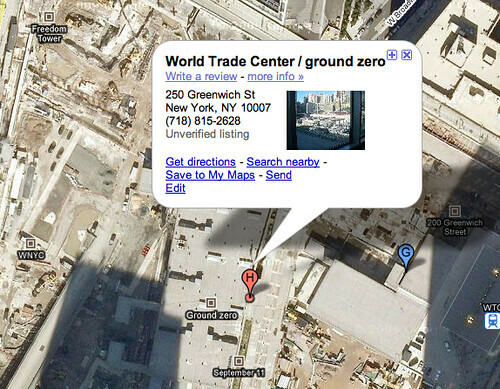 But some New Yorkers (and I am a New Yorker) are upset that Google still labels the area Ground Zero. Please remove the "Ground Zero" label from the World Trade Center site in lower Manhattan. I realize that anyone not from New York City comes here expecting to visit the site and that this is a common reference, but that is not its real name and it should not be used. It is equivalent to awarding the attackers a marksmanship medal, and we should not be doing that, nor frankly should we be equating what happened here with a nuclear bombing reference. All NY'ers refer to the site as 'the World Trade Center site', and that's what it still is to us, and will be again, if they ever get the construction completed. Finally, as a born-and-raised New Yorker who was here htat day I find the label 'ground zero' just plain despicable, and I really wish people wouldn't use it, and people I know here feel the same way. Please stop encouraging its use. I can totally understand this person's frustration and rational here. But from a searcher's perspective, people still search for worlds like "ground zero" and "september 11" on Google Maps. Google still wants to return those results. I guess technically, Google can hide the label on the map itself and just return this area for the search, but maybe searchers find it useful. Tough call here. As many people know, maps and borders and what you call places can become a very touchy and sensitive topic.